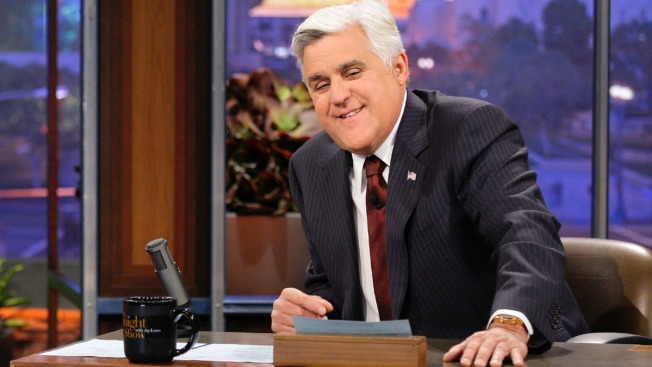 Jay Leno to Win Nation's Top Humor Prize in D.C. Newly retired from "The Tonight Show," Jay Leno is now being awarded the nation's top humor prize for following in the tradition of satire and social commentary of Mark Twain, the Kennedy Center for the Performing Arts announced Wednesday. Leno will be honored with the Mark Twain Prize for American Humor in a performance by his fellow comedians Oct. 19 in Washington. The show will be broadcast nationally Nov. 23 on PBS stations. The award recognizes people who have had an impact on American society through their humor and social commentary. "Like Mark Twain, Jay Leno has offered us a lifetime's worth of humorous commentary on American daily life," said Kennedy Center Chairman David Rubenstein in announcing the award. "For both men, no one was too high or too low to escape their wit, and we are all the better for it." After learning about the prize, Leno said in a statement that he's honored and is a big fan of Twain's. He said "A Tale of Two Cities" is one of his favorite books. But apparently no one told Leno that novel was written by Charles Dickens. Leno inherited the "Tonight Show" seat from the legendary Johnny Carson in 1992, beating out David Letterman, and was the top-rated late-night host for years. Letterman was the first between them to win the Kennedy Center Honors, but Leno was first to win the top humor prize. But Kennedy Center producers aren't weighing in on which man is funnier. For years, Leno also has maintained a busy schedule of stand-up comedy appearances, testing his humor in nightclubs and theaters with more than 100 performances a year. He passed the "Tonight Show" mantle to Jimmy Fallon in February. Since leaving NBC's late-night schedule, Leno has gained an international following online with his new creation, JayLenosGarage.com, about his obsession with cars. His YouTube channel now has more than 938,000 subscribers. Cappy McGarr, one of the humor prize's executive producers, said Leno has been on the list of great comedians to honor for a long time. It wasn't a question of waiting until Leno retired, he said. "Leno and Twain both have turned humor into a national conversation and a national conversation into humor, and I'm also quite confident they drove the same car," McGarr said Tuesday. "You know, we receive bad news every day, and it's important for us to keep our humor intact, as difficult as that might be. And thank goodness Jay has contributed to our American humor for a generation and made us keep things in perspective." Recent winners of the Mark Twain humor prize include Carol Burnett, Ellen DeGeneres, Will Ferrell, Tina Fey and Bill Cosby.